… Take two. I first made cookie dough brownies months and months ago but I decided to recreate them this week and share the recipe. It’s been a busy week for birthdays and I’m currently -1 cake in debt (sorry Mummy). This week’s bake doubled as a birthday bake and charity bake – two birds, one stone.. I’ll take it! My college (at uni) were having some sort of bake sale and I was asked to contribute. I was more than happy to participate, everyone loves a good charity bake! I hope the highest bidder is happy with their BBH goods! (It was a box of assorted baked doughnuts and cookie dough brownies). Everyone loves cookie dough. BakedByH loves cookie dough and you’ve seen it featured on here many times before. I think my personal favourite was that time I baked cookie dough in to a cake. These are super sweet. Not a bit sweet, or even moderately sweet. Super. Sweet. I knew this from the last time I made them, so I set about making some not-so-sweet changes. 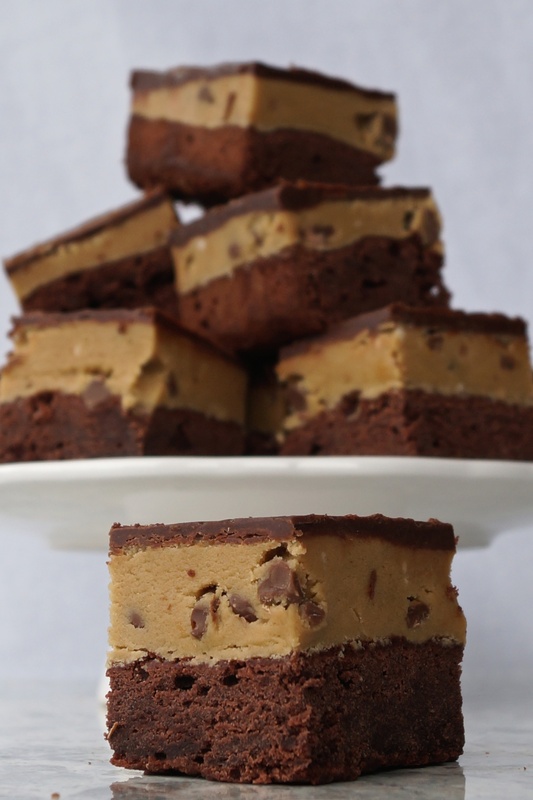 I mean, how much can you fiddle with cookie dough brownies?! The answer is, not much if you don’t have 3000 hours. 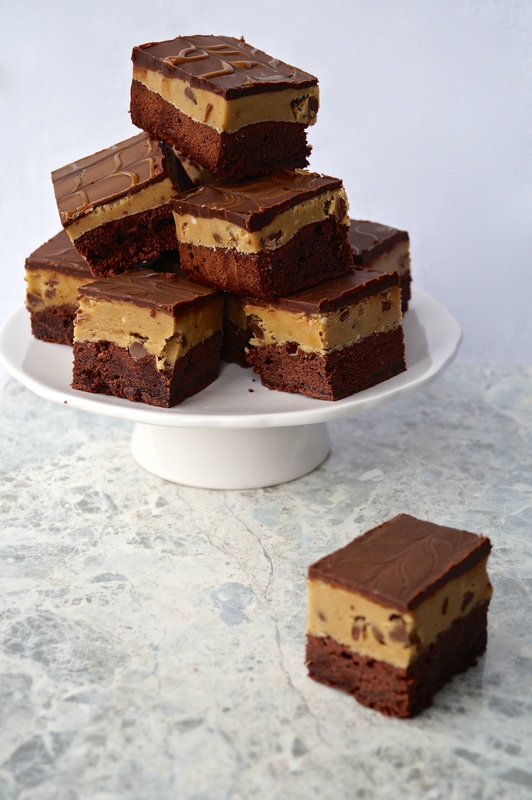 Last time I made them, I noticed that the cookie dough layer (my usual eggless and edible cookie dough) detached from the brownie layer when it was cut in to pieces. This time, I used some salted caramel sauce (that stuff again) to glaze the top of the brownie and stick the cookie dough frosting to the brownie. Yes, you read correctly. Cookie dough frosting. It’s essentially an american buttercream with brown sugar and a bit of flour in and it tastes exactly like cookie dough – except smooth! Perfect for frosting cakes and probably cookies with, though that seems slightly cannibalistic (…cookiebalistic?) Anyway, more on that later. 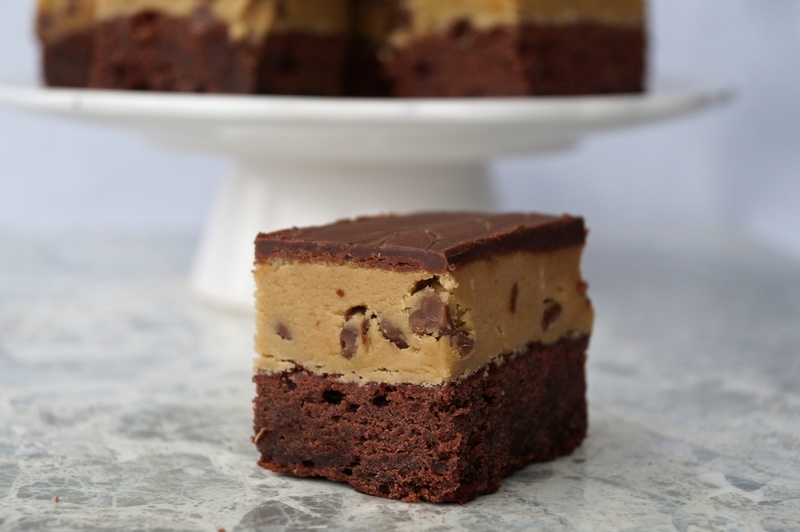 The brownie itself complements the cookie dough nicely, but I wouldn’t say it’s the star of the show, the whole thing in its entirety is what it’s all about, my friends. As I knew there were going to be candles involved, I decided to split the whole thing up a bit. I baked a big brownie in a large rectangular tin (traybake tin) and made a smaller brownie in an 8” round tin so it could be cut up like a cake. 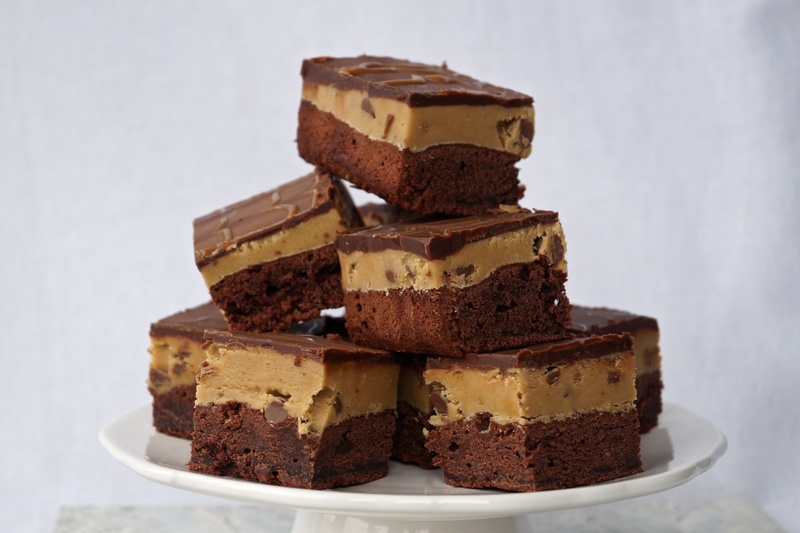 I loved the way you could see the layers of each in the round cookie dough brownie! 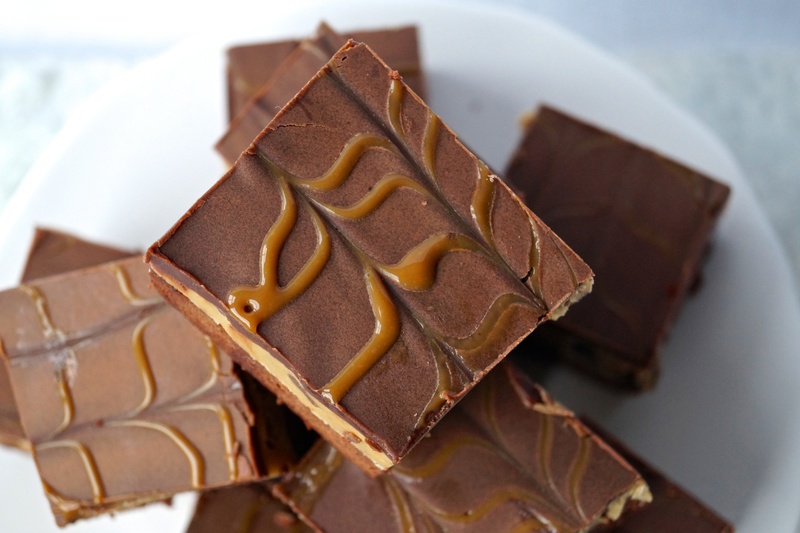 If you simply want to make a smaller batch, then halve the recipe and bake in an 8×8” square tin. Preheat the oven to 170FAN. Line a rectangular large-ish tin with baking parchment, leaving some overhang so you can remove it easily. Using a mixer, cream the butter and sugar for about 5 minutes. Beat in the cocoa powder, salt, vanilla and eggs one at a time ensuring everything is well mixed together. Alternate between adding flour and milk until it’s all done. I added half the flour, then half the milk and repeated. 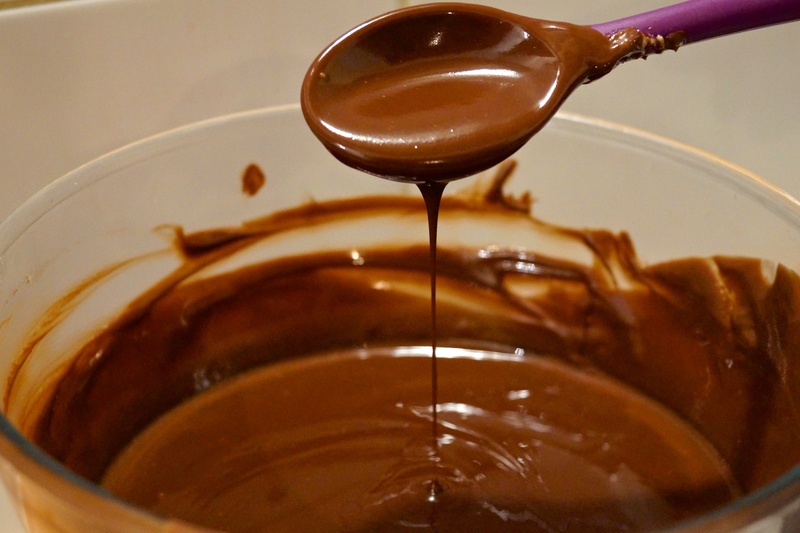 Spoon the mixture in to the tin, or tins and spread it out with a spatula until it’s flat. Bake on the middle shelf for 20-25 minutes until a toothpick comes out mostly clean. Leave the brownies to cool completely in the tin while you make the cookie dough. Sift the icing sugar into a large bowl and melt the butter in 20 second intervals in the microwave. Let it cool slightly and then add it to the icing sugar and mix together. It will be pretty crumbly! Add the vanilla, brown sugar and flour to the bowl and mix on low. Slowly add milk, by the tablespoon to the frosting and it will begin to come together. You don’t need much – you don’t want it to be the consistency of regular frosting, it needs to be quite stiff and dry. If it’s too slack, then add more flour, not more icing sugar. Stir through the chocolate chips. These keep nicely in the fridge and the freezer so don’t feel obliged to eat them ALL on the first day! (But of course, you may). Uhh, this whole post is rather drool worthy, especially the dripping chocolate! These sound so insane! Have to half, maybe quarter the recipe and give it a shot! And not that the old pictures were bad, these just got better!! Thanks for inspiring me to use my DLSR more often!